The FFP Time Tracker is a simple to use web-based solution for MMA and TCM time tracking needs. It allows users to track 100% of their on-line time in a secure environment. FFP Time Tracker is easy to use and can be accessed not only from any computer but also from most smart phones (i.e. iPhone, Blackberry, etc.). 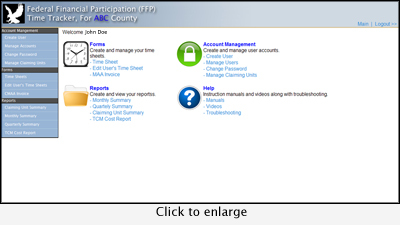 In addition, the FFP Time Tracker allows customization to fit your county's very distinct needs. It's a proven cost effective alternative to the overly burdensome task on managing paper time surveys. 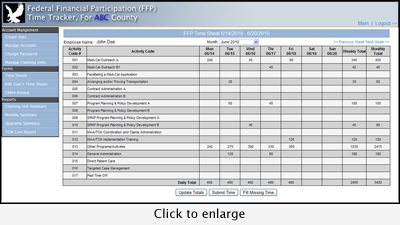 The FFP Time Tracker was specifically designed to meet the needs of those counties that are in the process of implementing a per-petual time study. Inputting time has never been easier. Users unfamiliar with on-line products will find the FFP Time Tracker easy to use. The software was developed with the inexperienced user in mind. There are numerous prompts and dialogue boxes that serve as helps stations. There are several important elements to the FFP Time Tracker: (1)Time data collection (2) Time data verification and validation (3)Data importation into MAA Claim Plan, MAA invoice and TCM Cost Reports (4) Reports. © 2009 Redondo Systems Inc. All rights reserved.